If he gets distant, your first instinct might be for him to try harder in case he’s showing interest. However, not when he has already tried all his best moves, and you still say no. Because nope, he just doesn’t care about what’s going on with you. And assumes you wouldn’t care about him either. A guy has to move on! If you want to play hard to get, then a guy can’t think that he’s the only person on your radar. Somebody needed to tell this girl that. 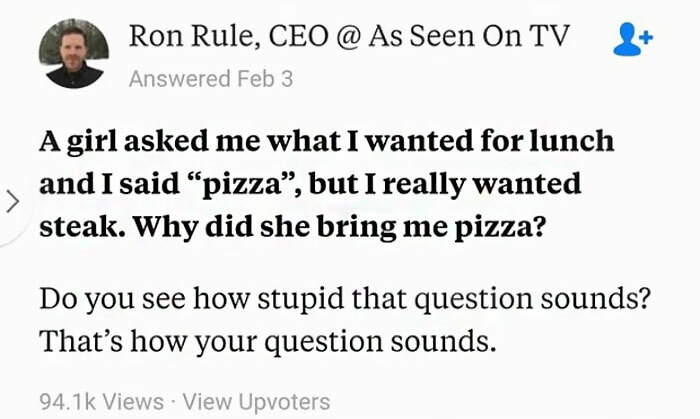 Luckily, Ron Rule came to the rescue and knocked some sense into this girl. And the inquirer “obviously” just had to understand. People started sharing their own experiences.